I have document lirabry and add a field "TempField" as a metadata type. I created a new managed property called "MangProp" which maps to metadata field "TempField"
now, this "MangProp" option Refinable is disabled. so i use default Refinable Property "RefinableString00" and Map "MangProp" property with "RefinableString00"
There are several ready made Managed Properties you can reuse, called RefinableStringNN. You need to wait (in many cases at least 24h) for the search to crawl content for your change to take effect. Not all options are available in SharePoint Online. In SharePoint Online, when you create a new managed property, it will have some limitations. For example, the property can only be of type Text or Yes/No, and it can't be refinable or sortable. So as @Jussi said you will have to use the existing RefinableStringNN properties and wait for at least 24 hours for the full crawl. 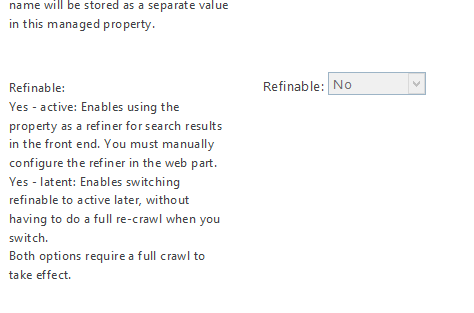 Refer Manage the search schema in SharePoint Online it has got nice details about managed properties. Not the answer you're looking for? Browse other questions tagged sharepoint-online search managed-property or ask your own question.